Olivia Pope wears many hats. Yes, she wears the white hat in general, but in her job, she sometimes has to put on hats that are a little bit gray. We’ve seen her save a marriage and we’ve seen her arrange a political marriage; we’ve seen her track down a missing woman and we’ve seen her tear apart a young woman; we’ve seen her negotiate wills, represent a dictator, and solve a plane crash; we’ve seen her negotiate a kidnapping, and in this week’s episode, we see Olivia negotiate a hostage situation. Ah, the many talents of Olivia Pope. We open on Mary Nesbitt, a seemingly sweet Midwestern mom, who asks to put OPA on retainer, right before dashing off to a meeting on the Hill. Olivia’s not sure exactly why OPA is taking on this woman, but even Gladiators gotta get paid, so they accept Mary’s check. The situation with this new client quickly devolves when Olivia catches up to Mary in her Congressman’s office, where she’s holding him and his staffers hostage with a homemade vest bomb. Turns out Mary’s son was killed in an FBI raid 15 months ago, and Mary’s demanding to know what’s in the sealed file that explains why the FBI thought her son was a terrorist. And now, Olivia’s caught in the crossfire between bomb-laden Mary and the FBI Commander, who is representing the government’s side of the negotiations from down below. Olivia is in a rather unique position in this hostage scenario, as she is both negotiator and hostage herself. 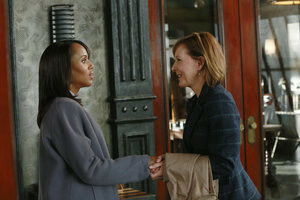 So any wrong move could put not only Mary and the Congressman’s lives in danger, but also Olivia’s. That point becomes abundantly clear when Fitz authorizes snipers to take a clear shot at Mary if they get it. The problem is that Mary’s thumb is inches from the trigger of her bomb, and Fitz doesn’t realize that his on-again-off-again love interest is in the room – until Olivia shows up in the window of the office with red sniper rifle lasers pointing straight at her forehead. Need I say that the sniper shot is quickly called off. So now, whether or not they want to, the government is put in the position of having to get Mary some information on her son if they want the situation to resolve non-violently. While Olivia has her people on the outside pull some maneuvers to try to get information, Olivia’s main job is to keep everybody in the Congressman’s office cool – and to stop that bomb from going off. To help craft this storyline, the writers and I looked at several high-profile hostage situations. The Munich Olympics, the Iranian hostage crisis, and the Moscow theater hostage crisis all offer lessons on how to handle – or not to handle – high-stress hostage negotiations. We also looked at interviews detailing hostage negotiation best practices. Olivia employs several of the ideas we discovered in research: be patient; keep things calm; don’t speak unless spoken to; make the hostage-taker feel like they are in charge; pay attention to what is going on around you in case you are released early on and can help the authorities plan a rescue mission. Olivia manages to make it through those first tense minutes, and buys enough time to get the government to declassify Mary’s son’s file. But, as in all stories in the Scandal-verse, the answer is not necessarily in black and white. I won’t reveal here how everything turns out for Olivia, but it’s safe to say that she’ll live another day to wear the white hat (or maybe the gray one). Tune in next week to see what other surprising talents Olivia has in her hat closet!